The Cocker Spaniel originates in England and was brought to North America in the 1800's. 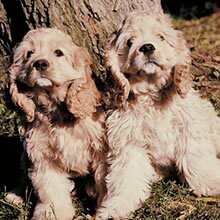 Since the 1930's, the American Cocker Spaniel and English Cocker Spaniel are recognized as distinct breeds (the American Cocker Spaniel is smaller). The Cocker Spaniel was reared to flush small prey from the brush for hunters. The name 'Cocker' is derived from woodcock, a bird the Cocker Spaniel was particularly adept at finding. Today, the breed is used to hunt game bird and water fowl. Famous Cocker Spaniels include Richard Nixon's dog Checkers and Lady from Disney’s “Lady and the Tramp”. The Cocker Spaniel is 38-41 cm (15- 16.5 in) in shoulder height and weighs 8-13 kg (18-29 lbs). Cocker Spaniels have long, hanging ears and a round head with a square jaw. Their back is short and the body tightly framed. The Cocker Spaniel has straight front legs and the tail is typically docked. The Cocker Spaniel has smooth hair of medium length. The hair should never be curly. The Cocker Spaniel coat may be a variety of colors: black, silver, cream, red, or brown, or a mix of another color with white. Non-black coats are known as ASCOB (Any Solid Color Other than Black). White, black, and cream coats are most common. Cocker Spaniels are intelligent, cheerful, lively and affectionate. They are very loyal to family, and love to play. The Cocker Spaniel is frequently merry and always ready to please. It makes a terrific pet and/or a fine hunting companion. Cocker Spaniels are intelligent, cheerful, lively and affectionate. They are very loyal to family, and love to play. The Cocker Spaniel is frequently merry and always ready to please. It makes a terrific pet and/or a fine hunting companion. Cocker Spaniels get along well with children and other dogs or household pets. They should be exposed to pets and children when young for maximum social potential. The Cocker Spaniel is very joyous and energetic, enjoying play. It sometimes likes to bark. The Cocker Spaniel requires plenty of attention, love, and devotion, and if it feels its not getting enough it will come looking. You can find Cocker Spaniel puppies priced from $195 USD to $16000 USD with one of our credible breeders. Browse through our breeder's listings and find your perfect puppy at the perfect price. Cocker Spaniels get along well with children and other dogs or household pets. They should be exposed to pets and children when young for maximum social potential. The Cocker Spaniel is very joyous and energetic, enjoying play. It sometimes likes to bark. The Cocker Spaniel requires plenty of attention, love, and devotion, and if it feels its not getting enough it will come looking. Cocker Spaniels must be brushed and combed thoroughly on a regular basis, preferably daily. Cocker Spaniels should be taken to a dog grooming professional two to four times a year to have excessive hair plucked by hand. The Cocker Spaniel is susceptible to ear infections, and sometimes eye infections. The ears should be cleaned frequently and regular eye exams are recommended. Cocker Spaniels have a lifespan of 10-12 years. The Cocker Spaniel is quite willing to learn, so training must be consistent but not overly firm. The Cocker Spaniel may be difficult to housebreak. A Cocker Spaniel should be walked three times a day or be given playtime in a yard of sufficient size. When walking, avoid brush that may tangle the coat. This breed also needs to run freely in the countryside on occasion. Most Cocker Spaniels love to swim. Cocker Spaniel Puppies for Sale - Shipped Worldwide! Finding the right Cocker Spaniel puppy can be dog gone hard work. PuppyFind® provides a convenient and efficient means of selecting and purchasing the perfect Cocker Spaniel puppy (or Cocker Spaniel puppies) from the comfort of your home, 24 hours a day, 7 days a week. Take advantage of our PuppySearch or leisurely browse our directory of hundreds of dog breeds, Cocker Spaniel dog breeders, Cocker Spaniel dogs for adoption, and Cocker Spaniel puppy for sale listings with photos and detailed descriptions. Some Cocker Spaniel puppies for sale may be shipped Worldwide and include crate and veterinarian checkup. Many Cocker Spaniel dog breeders with puppies for sale also offer a health guarantee. With thousands of Cocker Spaniel puppies for sale and hundreds of Cocker Spaniel dog breeders, you're sure to find the perfect Cocker Spaniel puppy.